A day of specially commissioned art and events will celebrate the 100th anniversary of Stonehenge being donated to the nation. 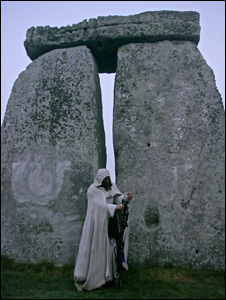 English Heritage and the artist Jeremy Deller will mark 100 years since Stonehenge was donated to the nation with a day of celebrations at the ancient stones. Curated by Deller, Friday 26th October will be full of music and art, an inflatable Stonehenge, an anniversary tea party, as well as a few surprises. A life-sized, inflatable replica of the British heritage and pagan site, and tourist attraction, Stonehenge. The artist describes Sacrilege as a light-hearted and playful way of visitors to “get reacquainted with ancient Britain with your shoes off”. Sacrilege has been loaned to English Heritage by The Store X Vinyl Factory, and will be outside the Stonehenge visitor centre from Friday 26th to Sunday 28th October. This ambitious project developed Turner Prize-winning Jeremy Deller’s exploration of art in public spaces alongside his interest in historic and contemporary icons.